The house received national distinction March 30, 2012 after current homeowner, Brian McGuire, a member of the Palm Springs Preservation Foundation, applied to the California Office of Historic Preservation, providing many qualified letters in support. The nomination was unanimously recommended, and the director of the National Park Service accepted the nomination. Designed by Wexler and built by the George Alexander Construction Co. in the early 1960s, seven one-of-a-kind homes then offered new, all steel technology in a proposed 35-home subdivision that was to be built along Sunny View and East Molina. Unfortunately, steel prices rose quickly making construction of the homes economically unfeasible. The once-forgotten subdivision today proudly features these iconic Steel Development Houses, now the subject of films, published articles, books, home tours and exhibitions such as Modernism Week held in February. Wexler is one of Palm Springs’ “big five” modernists – along with William F. Cody, Albert Frey, William Krisel and E. Stewart Williams. In the 1950s, he worked under Richard Neutra on the Lovell Health House in Los Angeles, considered to be the first steel-frame residence in America. He relocated to Palm Springs in 1960 to join Cody’s architecture firm where he developed a system of prefabricated steel houses. His design consisted of a concrete slab on which prefabricated kitchen and bath units were installed and the rest of the house — light gauge steel frame exterior walls and steel roof — were built up around this supporting center core. These elements comprised the basic structural modules which, when bolted to a concrete slab, formed the permanent structure. The 8-foot wall module panels were flexible for doors and windows placement, and could easily expand the size of the structure. Since the interior partitions were non load bearing, lightweight and structurally independent, they could be relocated, making the size of the rooms flexible. Originally, two-bedroom dwellings, the homes could be expanded to three or four bedroom houses. A crew of four men and a rig operator could install all exterior walls of three houses in an eight-hour day. The whole house could be built in two days and sold at $14,000. Wexler’s Steel Development Homes became prime examples of lower cost homes designed with good architectural skill, and are still a testament to what the modern subdivision could have been. He pioneered the concepts of pre-fabrication and standardized components, but with upscale modernist ideas. “Collectively, the Steel Development Houses represent an important chapter in the history of American modernist architecture and the subject house possesses a high degree of integrity and, by extension, is a fine representative of this unique collection of modernist residences,” said Marshall. 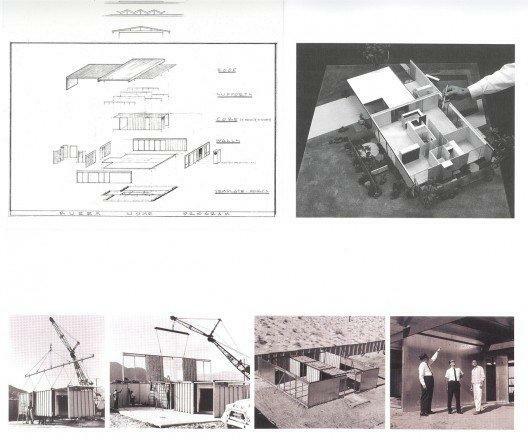 Wexler’s designs inspired similar projects across the country, including a few experimental houses by real estate developer Joseph Eichler. Today, desert modernism is a much sought-after architectural genre and Palm Springs is a virtual treasure trove of custom and tract home neighborhoods and important public buildings. Find the Wexler Steel Houses in Palm Springs on Simms Road, East Molino Road and Sunny View Drive.